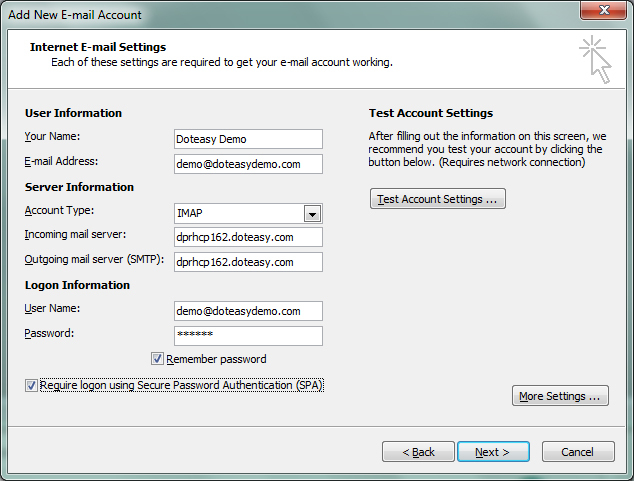 Your Doteasy domain email comes with both webmail and email client access. 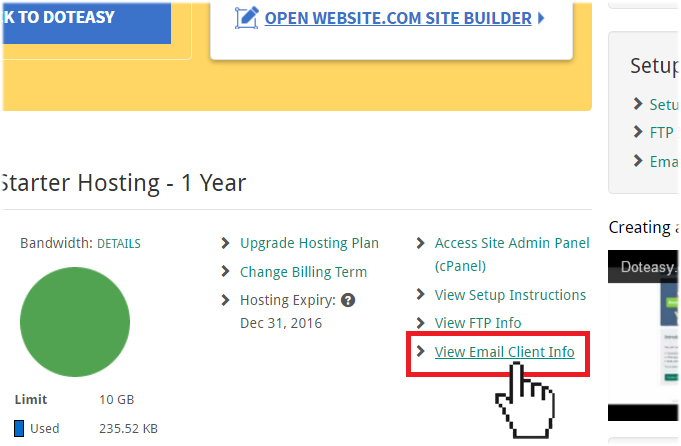 In this article we will show you how to access your domain emails using the webmail panel as well as an email client. If you’ve ever started a Gmail, Hotmail, Yahoo or other email account, chances are you’ve used webmail. With webmail, you read and send email through your web browser and a web-based interface. In fact, webmail allows you to access your email from any web browser, on any device, as long as you are connected to the Internet. When you access your domain emails via a webmail interface, you will open your web browser and type in the address of your webmail login panel. 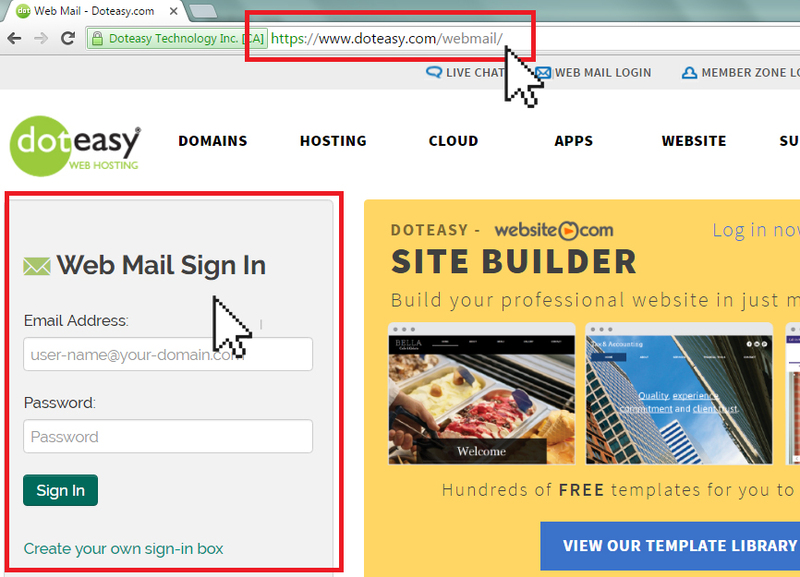 For example, if you are logging into your Doteasy domain email account via webmail, you will type in https://www.doteasy.com/webmail/ into your web browser. Then you will need to enter the address and the password of the domain email account you want to log into. 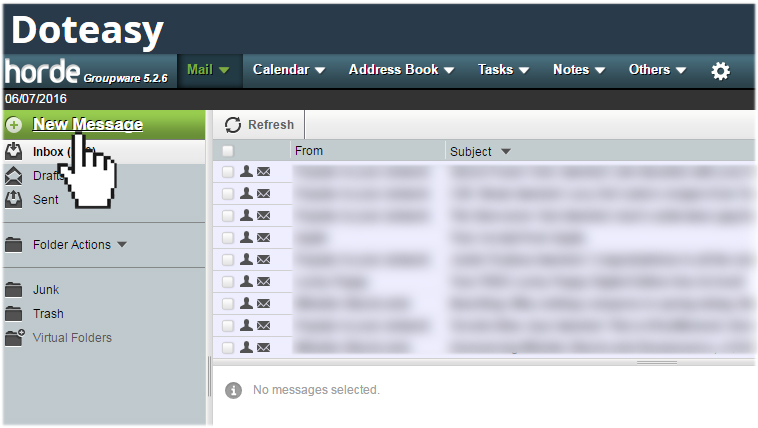 Once logged in, you can then read and send emails from the webmail interface. If you’ve used a program like Microsoft Outlook, Windows Live Mail, Mozilla Thunderbird or Apple Mail to manage your emails, then you’ve used an email client. An email client is a piece of software that is installed on your computer. You then use this software to download your emails from the server to your computer and from there you can read an send emails. In other words, in order to use an email client to access your domain emails, you will first need to install the email client software on your computer. If you are have the Microsoft Office bundle installed on your computer, you will find Outlook a part of the bundle; or if you are using a Mac, you can easily find Apple Mail, the default Mac email application. Other examples of an email client includes AirMail and Mozilla Thunderbird. Once you have installed the email client, you will then need to configure it so that it knows where (ie. which mailserver) to retrieve your emails from. Basic configurations include setting your domain email address, username, password, incoming and outcoming mail servers and ports. You will find your account’s email client info in your Member Zone. Webmail vs. email client – which one is better? Both webmail and email clients are used for sending and receiving emails. Webmail is portable and accessible everywhere – all you need is a web browser and an Internet connection. But email clients have their benefits, too. With webmail, all of your email is backed up on the server, meaning you will still have access in the event your computer breaks down. On the other hand, with an email client, your email is downloaded onto your computer, allowing you to backup your emails onto your hard drive or cloud storage, if you are using one (ie. Dropbox). An email client also allows you to manage your emails offline because email is downloaded onto your computer. Of course you will still need an Internet connection to download the emails from your server to computer, but once downloaded, you can access them anytime you want, even when there is no Internet connectivity. Not everyone needs offline access to their email, but if you need the ability to read your emails from a train or a long flight without Wi-Fi, then you will find an email client helpful. You have multiple email addresses with different domains, and you need the ability to manage (including read and send) emails from each one as individual addresses but all in one place (ie. without having to log into each address separately). You need access to your emails offline. You prefer to back up your email regularly and/or you have limited email storage with your email provider. When you access your emails using an email client, you are essentially downloading your emails from the mailserver to your computer. As long as you didn’t specify to save a copy of the email on the mailserver, the email will no longer be kept on the mailserver, thus freeing up server space. You need integration with desktop apps like Dropbox, Cloudapp, your calendar or other tools. You prefer a single inbox for each of your accounts. This way, you will need to log into each of the email accounts separately, but it keeps each account separate and easier to manage. You prefer web-based services to downloadable applications, or you don’t want to or can’t install software on your computer (ie. you are using a work or school computer). You feel more secure keeping your email online and off your computer. This is especially true if you are using a public or shared computer to access your emails.